What is a “fallen arch”? Why does a fallen arch occur? Fay is a custodian who has just turned fifty-three. She had flat feet since she was a child, but in the last two months, they seemed flatter and the insides of her ankles were painful and swollen. It was getting to the point that she was having difficulty doing her job and had to sit down frequently. She especially hurt whenever she had to rise up on her tiptoes. A fallen arch is when an arch, even one that has always been flat, has gotten flatter. There are several reasons for this. The bottom of heel tilts toward the inside, making the inside of the ankle appear convex or bowed. The feet often appear to be rotates outward, like a duck. And the arch sags toward the ground. “Fallen arches” are more than just flat feet. Having flat feet is not a disease. It is a description of the shape of the foot. Most flat feet have been like that all of the person’s life. Usually they are not painful. A “fallen arch” is a change in the shape of the foot. The normal gap between the floor and the arch on the inside of the foot narrows. It is usually painful, sometimes cripplingly painful and crippling. The heel leans to the inside, giving the inner ankle a bowed appearance. The joints of the outside of the crush together causing pain and swelling. 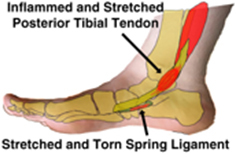 The ligaments on the inside of the ankle stretch causing additional pain. 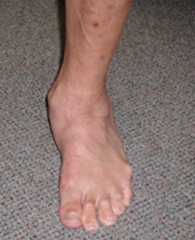 Over time, the joints of the midfoot and forefoot adapt to the tilting of the ankle so that the front of the foot remains on the floor, complicating the deformity. A fallen arch occurs because one of the main structures that support the arch has broken or torn. Usually it occurs without trauma, although a small injury associated with the onset of the pain is often recalled, it is sometimes difficult to determine whether the injury was clearly big enough to permanently injure the leg. I suspect that even before the symptoms that the structure that broke was weakening and the injury was simply the “needle that broke the camels back”. 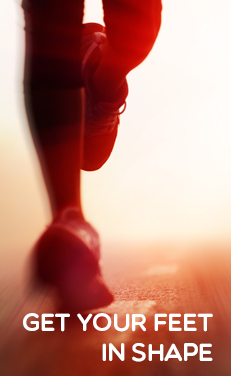 The structure that is most commonly torn is the posterior tibial tendon. This tendon is attached to a muscle on the inside of the back of the ankle, and runs along the medial malleolus, the bony prominence on the inside of the ankle, to attach to a bone in the arch called the navicular bone. It usually begins to weaken and stretch along the back of the medial malleolus. It often begins as a swelling and the arch flattens over the next several weeks to months. As the arch flattens, other structures that support the arch begin to stretch and tear. The bones along the outside of the ankle begin to crush together, causing pain and swelling in this are, and the toes may tilt to the outside as the arch collapses. It is not known why this process begins. It is often associated with diabetes and rheumatoid arthritis and other inflammatory diseases. It also is more common as a person enters the fifty to seventy year age range. “Fallen arches” are much more common in people who are already flat footed. Some of the aspects of the pain with a “fallen arch” are related to the crushing of the joints of the outside of the foot and from the stretching of ligaments and tendons of the inside of the foot. Unfortunately, some parts of the damage from the fallen arch, the weakness in the tendons and the new shape of the foot, are not correctable without surgical reconstruction. The first goal is to stabilize the collapsed arch. This can be done through braces. If the deformity is mild, an over-the-counter arch support may be sufficient. In more severe deformities an hinged or solid ankle brace may be necessary. Rehabilitative exercises under the supervision of a physical therapist will help increase the strength of the remaining muscles. Stiffness of certain tendons including the Achilles and hamstring is also very helpful as tightness in these structures is very common in people with “fallen arches”. Postural training is necessary. A short period of casting or walking in a cast boot will improve swelling of a recent partial tear of the tendons and ligaments on the inside of the ankle. Nonsteroidal anti-inflammatory medications such as ibuprofen, and naprosyn can help to relieve the pain, but do not heal the injuries associated with this or decrease the swelling significantly. Surgical reconstruction is available if the pain cannot be controlled reasonably with these measures.